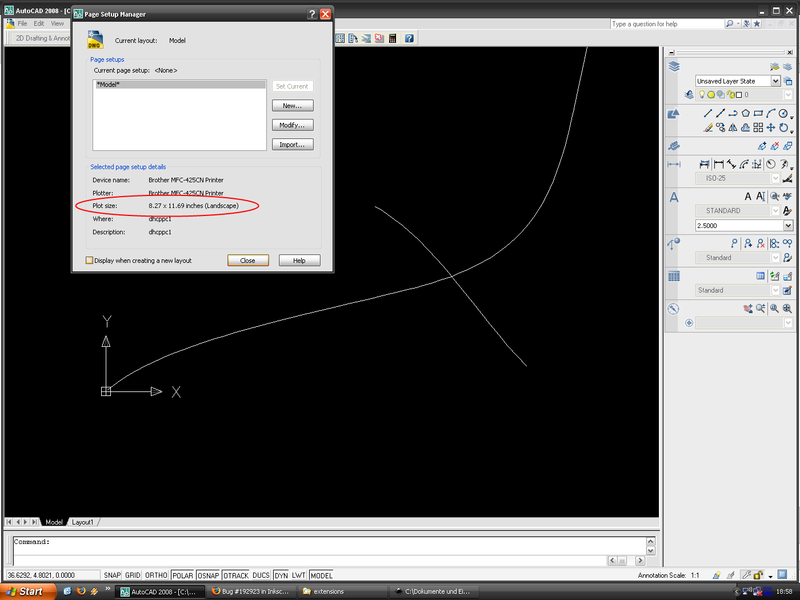 This extension generates two types of DXF ENTITIES: SPLINE and LINE. The LINE output is readable by DXF viewers, the SPLINE output is not readable by Voloview Express 2.01 or DWG TrueView 2008. A proposed modification is attached. The file dxf_outlines.py has been modified as follows : the file dxf_outlines.dxf has been added as a new dependency and has been used as a template file to generate a header and footer that are consistent with AutoCAD 2000. 1. text was converted using the Path | Object to Path procedure. 2. all objects on the drawing were selected using Edit | Select All, and were slightly translated and then translated back again, which removed all the 'transform' attributes from the svg paths. just for fun, attached is a DXF version of the Inkscape logo. Before doing the output, the menu procedure Object | Ungroup was used to get rid of an unwanted 'transform' attribute. Aaron--could you check out Alvin's patches? See also bug 167768 Thanks! First of all before I get too far, two apologies, I apologize for the length of this response because it will be long, and I apologize for mangling your code, because it was elegant. The code you wrote for python extensions is some of the most elegant and powerful stuff I have ever seen. I'm an old QBASIC person, grew up on FORTRAN IV, so this is a bit new to me, and very refreshing after looking at spaghetti code at work. in the HEADER section. Then the spline elements will be properly recognized. Anyways, that was also the good news, the really bad news is that I have not been able to find any meaningful documentation on what would constitute a reasonable value for $HANDSEED, that appears to be a very closely guarded secret. This is the point at which I gave up and cried uncle. I could not make sense out of where this data is coming from, so I generated a standard ACAD2000 format DXF file using AutoCAD LT 2002, and used it as a template. I believe that if a meaningful value of $HANDSEED could be developed, then a more minimalist version could be produced, which I am all in favor of, but can't figure out how to accomplish. Thanks for the feedback, I will investigate the handle issue some more, and if I have no luck at all then I'll report back. seem to remeber that it was even able to render 3D DXFs into 2D for import. layers, colors, trace, splines, dimentions"
Thanks for the feedback, I run the win32 nightly builds, so I will download one the earliest opportunity, which I think will be Wednesday. Most people would not use Trueview because it is humongous, its only merit being that it has nice error messages. Anyways, I predict that no one will even detect that a change has been made, but I will respond back here as soon as I see the new version. Thanks for the help. much wider field of users with just a few simple changes, I say go for it. Did you have any ideas about the scales needed to support other software? I have access to Autocad Lite at work, so I'll do some cross-checks between Inkscape coords and Autocad coords and see how they match up. On a somewhat related subject, is it possible from a python script to read an Inkscape preference value like "Default Export Resolution", which I think was originally 90 dpi, but can be changed by a user? - ran the desktop cutting plotter on the file Venus_and_the_half_shell.svg and viewed the dxf output file in Voloview Express. Milestoning for 0.47. Did anyone commit this to trunk? Has anyone tested this with robomaster? Seems to be a concern in earlier comments. Previously these dxf files were viewable in QCad but were not viewable in Voloview or other Autodesk products because these other programs sometimes have more stringent syntax requirements. With the modification these files are now viewable in Voloview. could you attach an .svg file that you would like to convert to .dxf ? All the Inkscape paths are split and converted into Autocad arches but they are not joined together as it should be in my opinion, so you have to do it by hand. Maybe this functionality could also be added? I am attaching a new version of the template file. In Voloview this has the effect of converting the display units from inches to mm while keeping the same numerical value for the data. Would you be willing to test this in AutoCAD to see if it helps? You'll need to rename it to be dxf_templates.py, and first make a backup copy of your existing file, just in case. Hm, I don't see the new file changes anything. See screenshot to see how it is cut at the beginning. But I don't think that this is the optimal solution. Better if you could just open it like that. thanks, I don't think the version number will matter, either one is fine. Ok, i just started autocad and did -> save as -> autocad 2007 dxf. When i looked at the source code of the template.dxf I saw that there was a line with my name in it. thanks for the file, I'll see if I can extract the scaling information from it. This may take a while, scaling in AutoCAD is more difficult than I expected. Attached is a new version of the templates file. In DWG Trueview this has the effect of generating an initial display in Model Space which is 297 mm. high. This will need to be renamed to be dxf_templates.py before using. Hm, doesn't change anything in autocad. Now that I know that i can use this extents button to solve the problem, it is not such a big deal for me but it would be cool to just open it in the correct size. I hope my cousin will answer my mail so I can tell what is important for CNC. without specifing other options than -mm it seems to be the best way to convert text. Because every single letter will now consist of a closed and connected polyline instead of a bunch of unconnected single lines. Glad to hear that pstoedit worked. I am going to mark this as Fix Released again; if any new issues arise, then probably the best thing to do is raise a new bug report. I have to report another bug with dxf export I often encounter. When the dxf file is opened in Autocad and I try to save it again in Inkscape, then Inkscape crashes completely instead of throwing some error message like "file could not be accessed!" Yeah, you are right autocad is somehow blocking the file, but this should not make inkscape crash. Because there is a great danger of loosing unsaved data! okay, I take that back, I have been able to produce an Inkscape crash by manually forcing a dxf file to be read-only in between successive saves. This is the type of condition that could probably be detected from inside a Python file, so I will take a look at it. Could someone please file another bug about the read only output file issue? I'm afraid that it will just stay burried here. the file dxf_outlines.py has been modified to replace all instances of the LINE entity with the LWPOLYLINE entity. This will be most noticeable when using the menu item Effects | Modify Path | Flatten Beziers. The LWPOLYLINE has the property that it does not break apart when edited, either in QCad or in ROBO-Master. This change will affect all line segments both in QCad and ROBO-Master, but it will not affect any splines in either program. Individual lines turn out the same regardless of whether they are called LINE or LWPOLYLINE. The polyline has been tested in ROBO-Master Pro Version 4.30, to confirm that the polyline is editable with no breakage and no crashes. I will investigate the scaling some more in the new year when I have access to a machine with AutoCad on it. good to hear, I am attaching the latest version of the file dxf_templates.py .